Thanks to our Southwest Airlines Companion Pass, we had the chance to take a quick trip from Los Angeles to Portland, which has been on our radar for quite some time because it seems like everyone loves Portland. The Companion Pass and some IHG points enabled us to have free airfare and one night hotel free, which sure helps a lot for a quick 3-day vacation. We found hotels in Portland to be very pricey. We ended up using Club Carlson points to stay at the Radisson by the airport because all the downtown hotels require so many points. We arrived early in the day and the hotel held our luggage. We took public transportation about 45 minutes from the airport to a station near the hotel (free shuttle between the hotel and that station) to downtown for a long day of sightseeing. A couple outfits offer free walking tours but the times are limited and none fit our schedule so before we left home, I printed a free walking tour of Portland’s famous fountains so we could explore on our own. It was a damp, chilly day but all the locals were in shirt sleeves. We are too used to southern California weather! We stopped at the tourist office in Pioneer Square for a detailed map and directions to the famous food truck area for lunch. Downtown Portland is very compact, in fact, it’s much smaller than we expected. We were really looking forward to sampling a number of options at the large food truck park downtown but we found the trucks to be quite expensive, plus the weather wasn’t optimal for sitting in the park to eat. There are at least 30 carts to choose from but we decided to gravitate to a couple of carts that had the most people waiting. We split a grilled cheese sandwich from one truck and split a pastrami sandwich from another. Both sandwiches were good but pretty small so we ended up eating a second lunch a couple hours later at Cheryl’s On 12th for some soup, wine and complimentary beignets for dessert, all for about the same price as our sandwiches from the food trucks. Overall, the two lunches combined to be one expensive lunch. I wouldn’t bother with the food trucks next time but it’s a novelty for a first visit. The Radisson at the airport is actually set next to a large pond in a woodsy area about 5 minutes from the airport (free hotel shuttle). 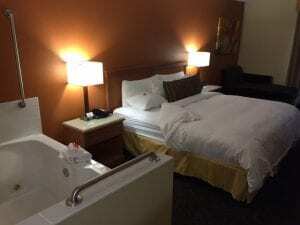 It wasn’t the best use of 28,000 points because a room night only cost $135 but we have a hard time finding Club Carlson hotels to use our points so this fit the bill and saved us money. The room was huge with a giant spa tub in the sleeping part of the room, which is so 1970s. By the time we finished our long day of walking downtown, we were ready to head back to the hotel. Since there aren’t many dining options near the hotel and we were too pooped to go back downtown, we ate at the hotel. The restaurant was packed and our meals were really excellent. We had good food at the Holiday Inn Airport in Ft. Lauderdale the month before, and in both cases were shocked that hotel food, particularly at an airport location, was so good. We woke up early and got our rental car from the airport to head to the Oregon coast. We didn’t have a set plan but decided not to bite off too much since we only had one day and night to explore the coast. 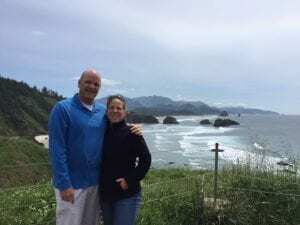 We took highway 26 from Portland to Cannon Beach and got there in time for lunch! It’s a charming, small tourist town with a dozen restaurants, cafes, boutiques and trinket shops. We just walked around until we found a reasonably-priced sandwich shop and then set off to drive down the coast. 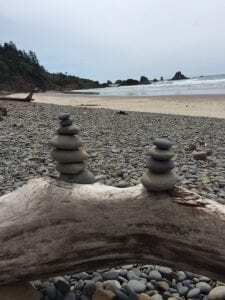 We stopped at Ecola State Park and did a short 30-minute hike and just gazed at the views. It was a gray day but the scenery was absolutely stunning! We have seen a lot of coastlines, including our own California coast, but I thought Oregon’s was the most beautiful. We continued down the coast, stopping here and there for photos. We were ready for a coffee break about the time we hit the town of Garibaldi and found a tiny cafe, the Parkside Coffee House, with excellent homemade desserts. We held our noses as we drove through the town of Tillamook…wow, the stench from the cows is horrible! We had thought about spending the night in Tillamook, but no way! I love factory tours and supposedly there’s a good one at the Tillamook Cheese Factory but I didn’t want to get out of the car to do that so we just drove through town as fast as we could trying not to breathe too deep. Sorry Tillamook! From Tillamook we cut over back to the coast on highway 131 and drove up a small peninsula to the Cape Meares Lighthouse. It was closing just as we got there and no new visitors were able to go into the lighthouse. It was a nice drive but the park was not as great as Ecola State Park. After the lighthouse, we retraced our way south back down the peninsula and then continued south on a local road hugging the coast to Pacific City. We got there just in time for a beer at the Pelican Pub & Brewery. We ordered beers and sat out on the patio overlooking the huge beach and ocean. There are some great sand dunes next door to climb. I’m sure this beach is packed in the summer. We were hoping to find another town in time for sunset so we got back in the car and headed further south. We decided to call it quits in Lincoln City and get a room for the night so we could hit a late happy hour for drinks. There are a lot of hotels in Lincoln City along highway 101 but those are a few blocks inland and we wanted a room with a view. When I was a kid on family vacations my dad would just go into a hotel and negotiate a price assuming at the end of the day the hotel operator would rather give him a deal than let the room go empty. So that’s what we did…we stopped at the Starfish Manor Oceanfront Hotel and asked what kind of deal we could get. They also operate the Beachfront Manor next door. The front desk clerk told us we could have a room at the Starfish for $100 or the Beachfront for $80. We checked out the Beachfront first–it was a nice room with a peek-a-boo-view and perfectly acceptable. 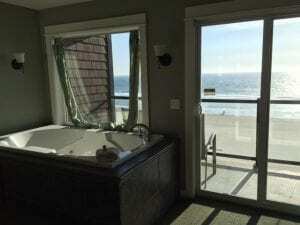 Then we looked at the Starfish room–it had a full ocean view, balcony, fireplace and a huge spa tub in the room looking out over the ocean. We took that room and we were lucky to get it!! I checked the regular rates and it’s over $200 per night so we got a great deal. We ate dinner at the Spanish Inn in the Fathoms Penthouse bar upstairs where all the locals hangout. The bar has a limited food menu but enough for us to enjoy an affordable dinner. 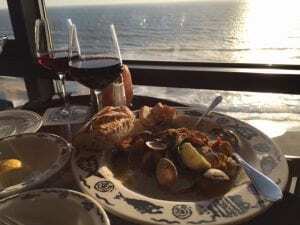 We arrived just before the end of happy hour and got 3 appetizers for $5 each, a bowl of steamed clams and a couple glasses of wine at happy hour prices, and sat at a table along the window with a full ocean view. It was perfect! We took Route 18 from Lincoln City heading up for a day of wine tasting in and around McMinnville and Dundee. McMinnville is a small town that is somewhat touristy but also a real town with business other than tourism. It’s charming downtown area is about six blocks long. It’s perfect for a pit stop and lunch, in our case. We ate at The Sage Restaurant, upstairs above a store (you have to walk through the store). The food was pretty good but my dessert of marionberry pie was wonderful. I am now hooked on Tillamook marionberry ice cream because of this lunch experience. 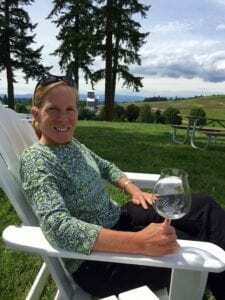 We are not very familiar with Oregon wines so we didn’t map out a plan like we do when go wine tasting in California. Instead, we drove around and looked for tasting room signs. Fortunately, the wineries we went to don’t require reservations. Two highlights were Dobbes Family Estate and Stoller Family Estate. At both properties we split flights of wine for $15 and sat outside as it was a warm, sunny day. We usually split tastes to both save money and so we don’t consume too much. We ate dinner at Recipe–A Neighborhood Kitchen in Newberg. It’s an upscale restaurant in a charming cottage and a bit steep in price–entrees ran from the mid-$20 to low-$30 range. It was good but not memorable. In that price range, I expect it to be more memorable. We didn’t bother with dessert. Portland was nice but it wasn’t as great as I expected it to be. Wine tasting was fun but it wasn’t the wine destination I thought it would be. The coast was wonderful and much better than I imagined it could be. If we go again, and we probably will someday, we will spend more time exploring the coast, hiking and gazing at the ocean. Thank you for the comment. We tend to plan in advance for most things but some of our best experiences have been when we didn’t.